LAGOS (THE NATION)--A real estate company, Diaspora Lakeview Estates Limited, said it is partnering with Thesaurus Gardens Limited to co-develop ‘Diaspora Lakeview Estate’ which is the first CCTV powered estate of its kind. 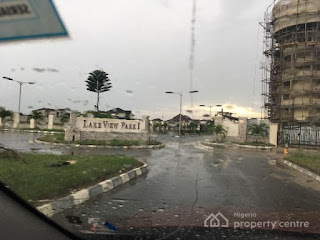 The estate is located within the Caribbean Lake City, along Lekki-Epe Expressway, opposite Crown Estate, and situated in the neighbourhood of other estates namely Emperor Estate, Fara Park and Novare Mall. According to the promoters who spoke to the The Nation they revealed that the Lagos State allocated to Thesaurus Gardens Limited 51 hectares of land, from which Diaspora Lakeview Estates Ltd derives its title. They said the joint venture would seek to improve and restore confidence of Nigerians abroad who have always wanted to invest in landed properties but have fallen victims to land grabbers popularly referred to as ‘Omo-Oniles’. The Managing Director of Thesaraus Gardens Limited, Bolaji Olasode, said the collaboration with Diaspora Lakeview Estates Limited is strategic for both companies geared towards giving prospective land owners a peace of mind in acquiring property. He went further to state that a unique feature of the estate is the waterway transport system through which people can travel by sea to all parts of Lagos State, while stressing that the cost of land at the Diaspora Lakeview Estate will appreciate rapidly and the return on investment is speculated at 100 per cent in two years. According to the Chairman of Diaspora Lakeview Estates Limited, Prince Williams-Joel said the innovation in real estate will seek to provide an outstanding level of service, excellence, expertise, and security in securing real estate investment and development. Joel further said that the estate will boast of 24 hours power supply, internet services, waterways transportation, amongst others. As part of its goal in offering affordable real estate services, the company is embarking on a Real Estate Promo with a plot of land being sold for only N10, 000,000 (Ten Million Naira) as against N12, 500,000 (Twelve Million and Five Hundred Thousand Naira) and the promo closes on the 16th of February, 2019. Whilst enumerating the benefits of acquiring land especially along the Lekki-Epe axis of Lagos State, he also stated that preparations are on top gear to make similar arrangements for those interested in developed buildings in Abuja and Port Harcourt, with a development of duplexes and blocks of flats.